lines, the heritage of many European fashion luxury brands originated in accessory design. This studio course is designed for students who already have an in-depth knowledge of fashion design and the fashion industry. 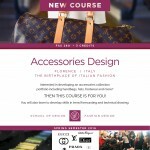 The course includes the design, technical and business skills necessary in the creation of accessory products. Particular attention is given to trend forecasting, design sketching and technical drawings. Students design a small range of accessories and develop a collection portfolio focused on handbags, millinery, shoes, belts. Knowledge of CAD technology is required. 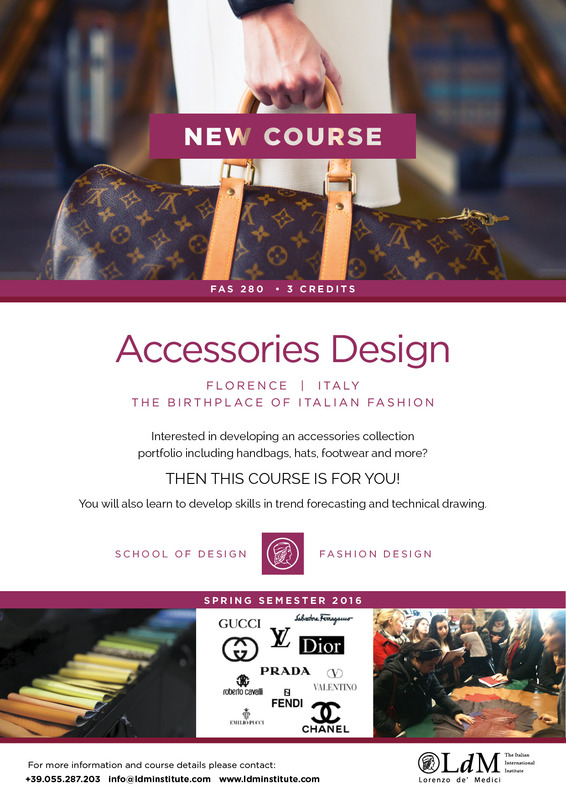 Prerequisites: FAS 200 Fashion Design Computer Principles I, and FAS 160 Fashion Illustration I, or equivalents. Project-based service-learning studio course emphasizing team approach to solving complex design problems that enhance social and civic functions within societies. Students develop architectural projects in the local community working hand-in-hand with an institutional or not-for-profit type clients. Involves client interview and reviews, research and analysis of an existing site, sustainable goals setting, rudimentary urban planning and permitting, architectural programming, schematic design, project management and documentation. 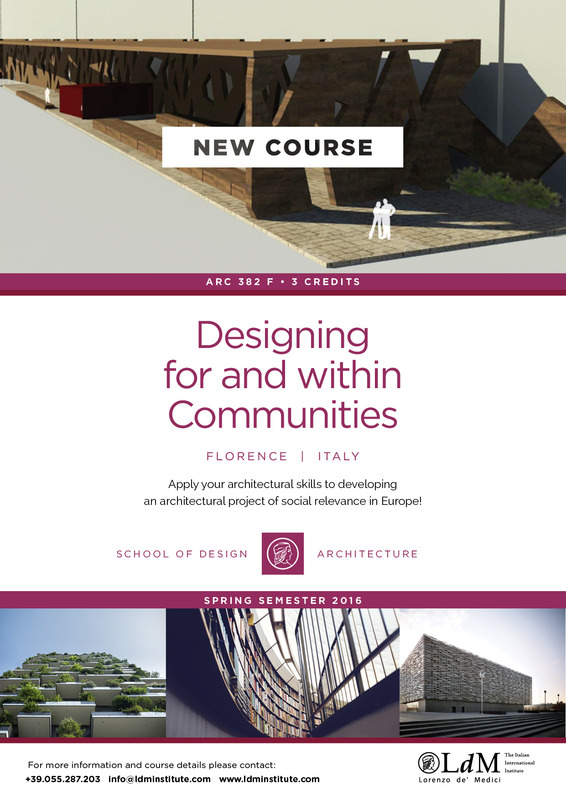 This course emphasizes community service activities and interactions with other professions within the built environment as a methodology to enrich personal growth and academic development. Note: It is highly recommended that students be equipped with a personal laptop for design projects. Prerequisites: Architecture majors of junior standing. Description: Comprehensive study of the factors influencing the perception of form and space in environmental and artistic applications. Studio investigations include design of objects, development of interior and exterior spaces, and the interaction among them. Students study fundamental elements of three-dimensional design and their application in providing solutions to real-world problems standing. In order to truly grasp the shift in economic power that is currently changing the global economy, it is fundamental to understand the Chinese history of economic reform and its political, environmental and social context and implications. 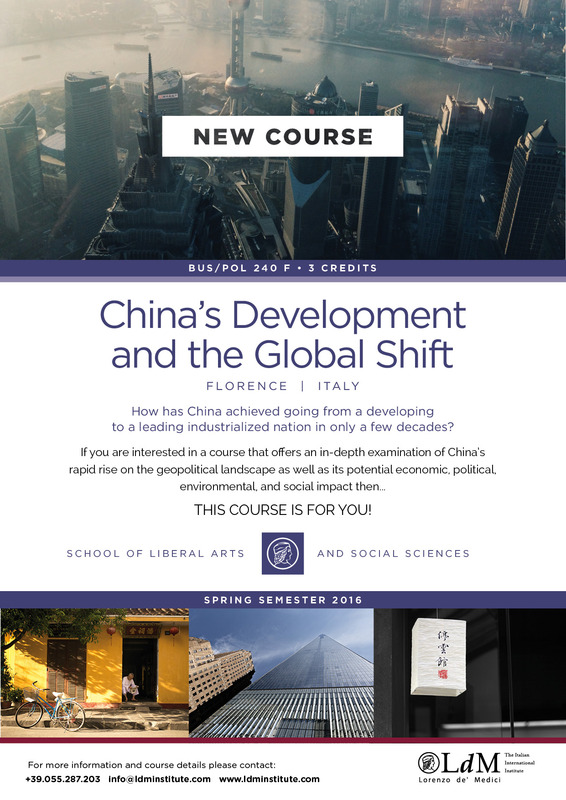 This course aims to explore the mechanism and consequences of modern China’s economic development as well as China’s role in the global economy. Most of the analysis focuses on the recent history of China, especially following 1978 when China began its dramatic transformation from a planned to a market economy. The course will be organized around a number of major themes which include references to the historical and institutional background, the “rise of China” in the current geopolitical imagination, and key issues in China’s foreign relations. 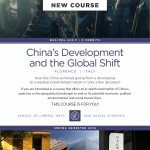 The key questions we will try to understand in this course are: is China’s growth rate sustainable; can it be repeated in other developing countries; and what are the costs of this rapid growth? Prerequisites: recommended: POL 150 Introduction to Political Science and BUS 180 Principles of Macroeconomics, or equivalents. 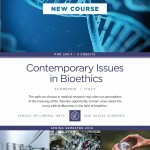 This course analyzes some of the main ethical arguments and positions related to medical care and biotechnology. 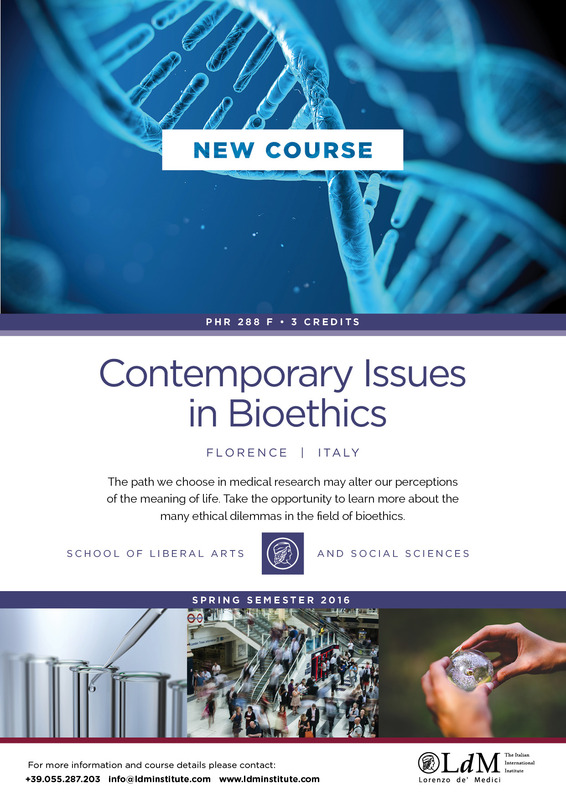 After a brief introduction to the history of bioethics, the course explores ethical issues in the practice of health care, including patient autonomy, informed consent, surrogate decision making, truth telling, confidentiality and problems in the allocation of health care resources. 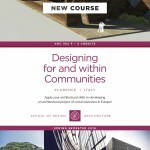 The course then focuses on beneficial and non beneficial clinical research with human subjects and stem cell research, as well as end-of-life issues including palliative care, physician assisted suicide, euthanasia, the foregoing or the withdrawal of treatment and the notion of sanctity of life. The course examines the main questions regarding the beginning of life, such as pre-natal screening, assisted reproductive technologies and abortion. Finally the course turns to emerging genetic technologies such as personalized medicine and human enhancement. Through both writing and discussion students will learn to think carefully and critically about the merits of competing responses to various bioethical questions. They will also learn to develop and defend their own position on these issues. 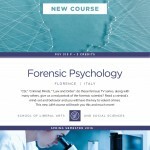 The course offers an introduction to the field of forensic psychology, starting from the definition of crime and theories on development of criminal and delinquent behavior. Topics of the course include: criminal homicide, stalking, sexual assault, family violence and child abuse. Students will acquire basic knowledge of investigative psychology including geographical and criminal profiling. Special emphasis is given to consulting with courts and the rehabilitation process in correctional facilities. Prerequisites: PSY 150 Introduction to Psychology, or equivalent. 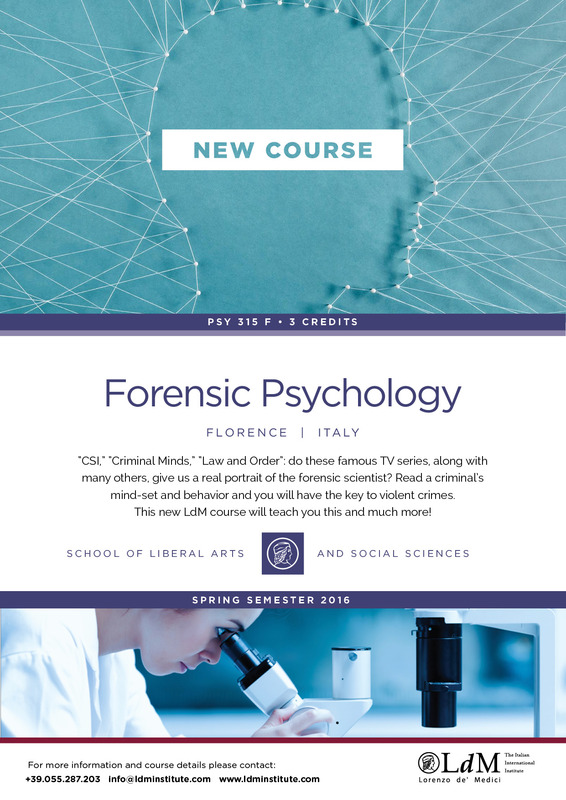 Recommended: PSY 305 Psychology of Crime, or equivalent. 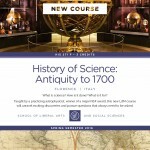 This course examines key episodes and themes in the history of science up to the 17th century. Students will learn to situate scientific ideas within their social, cultural, and broader intellectual contexts. 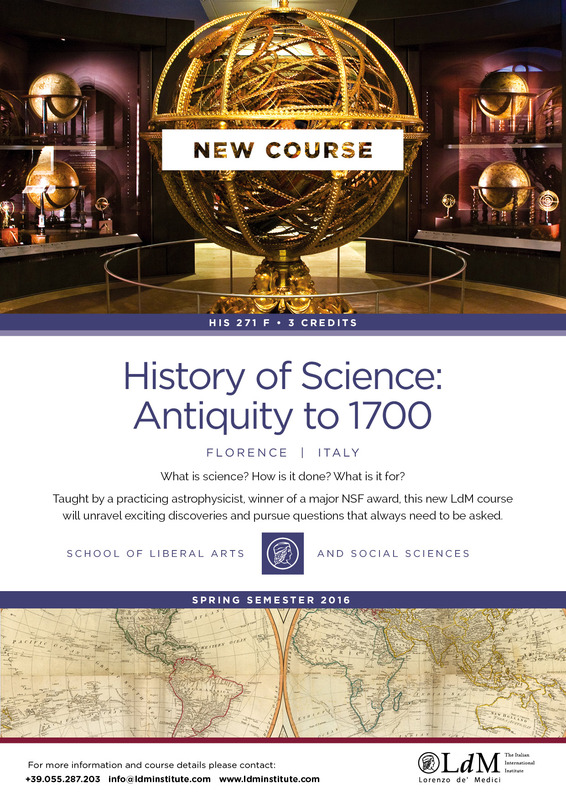 We will survey a range of scientific developments, treating science both as a body of knowledge and as a set of practices, and moving across centuries, continents, and disciplines to see how what we know about the natural world is tied to the who, when, where, and how’s of knowledge production and circulation. To understand how modern scientific practices emerged, we will examine the changing nature of scientific inquiry and methodology, the importance of social supports and institutions for scientists, and the growing cultural importance of science in society. 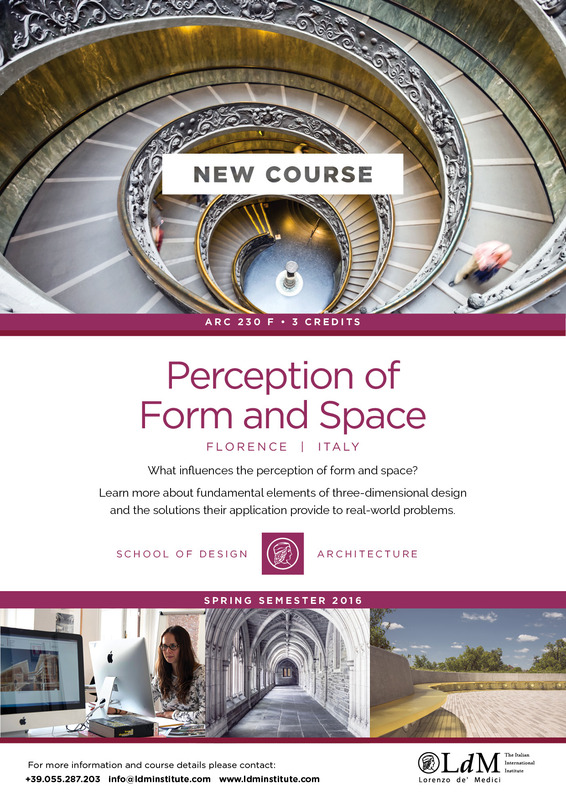 The main topics of this course are: 1. the emphases that civilizations have placed on either theoretical science or practical technology; 2. the effect of culture on the questions that science asks; 3. the relationship between science and religion. 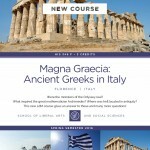 Study of the extraordinary flourishing of ancient Greek culture in the region corresponding to present-day southern Italy. 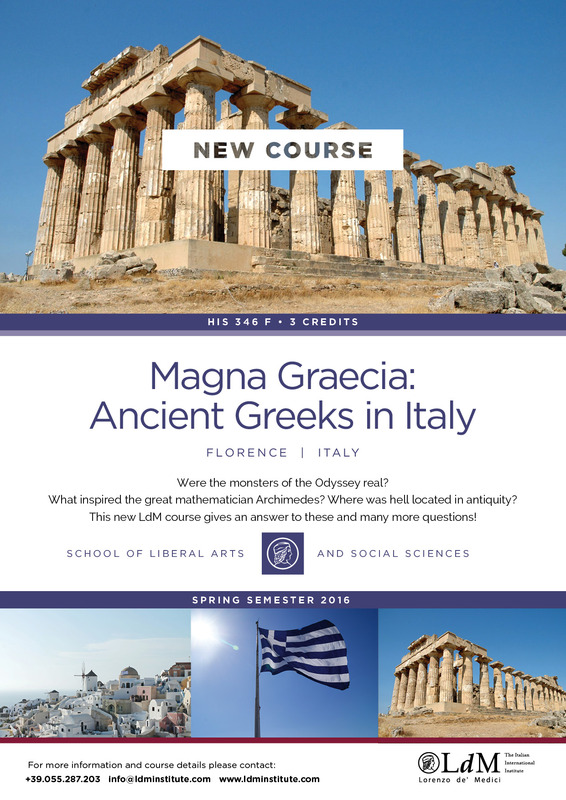 The course utilizes archaeological, literary, historical, and epigraphic evidence to provide an interdisciplinary understanding of the area where Western civilization and its classical heritage developed. The Homeric age of the 8th and 7th centuries BCE saw the end of the Trojan War. Just as Odysseus went westward, so did many Greek adventurers, traders, and refugees from the East. Greek city-states soon colonized the coastal areas of southern Italy and Sicily, an area that became known as Magna Graecia, “Greater Greece.” Its settlers mingled and intermarried with the local population, while the great city-states of Sicily, including Syracuse and Selinus, more closely tied to mainland Greece, even hosted such renowned Greeks as the philosopher Plato and the tragedian Aeschylus. Indeed, the Greek alphabet and traditions, mythology, religion, art and artifacts, philosophy, and political institutions all profoundly influenced the wealthy Etruscans in central Italy and eventually the Romans (Horace spoke of “Graecia capta”). Significantly, this influence did not supplant the deeply-rooted local languages and religions. The Etruscan and Roman worlds, unique classical civilizations in their own right, never became wholly Greek. 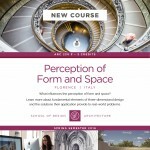 Introduction to the physics of sound and light, with applications to music and visual arts: sound perception, harmony, musical scales, instruments, lenses, cameras, color perception and mixing. 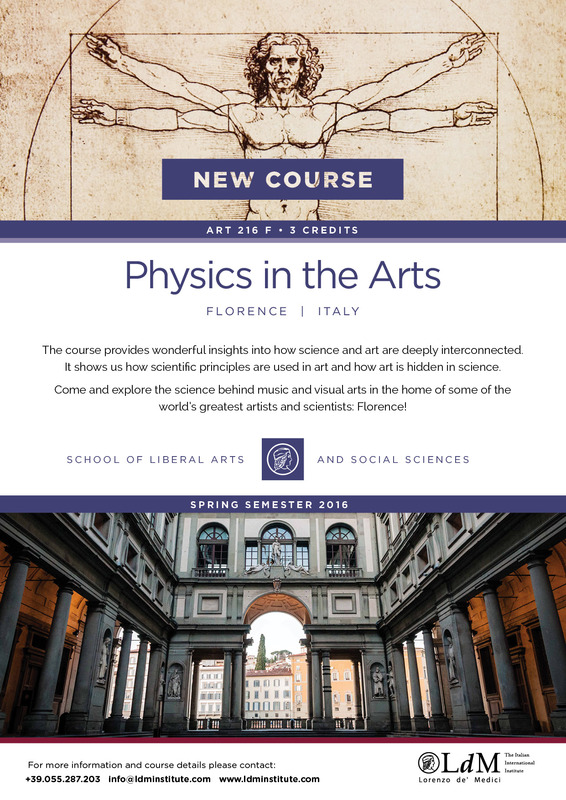 This course presents science through art and art through science. The wisdom and perfection that underlie the structure and the laws of the universe have inspired generations of artists especially in the Renaissance. Leonardo da Vinci epitomized the Renaissance man – a creative artist who painted Mona Lisa, an architect, an inventor and an investigative scientist of the natural world – who made no distinction between these roles. Science and Arts are two different faces of the same coin, and many scientists and artists have the common aim of describing nature. 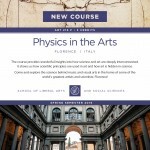 This course is a wonderful insight into how science and art are deeply interconnected. It shows us how scientific principles are used in art and how art is hidden in science. The course uses algebra and geometry; intended primarily for non-science majors. 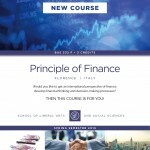 Course covers fundamental principles of finance with an international perspective. 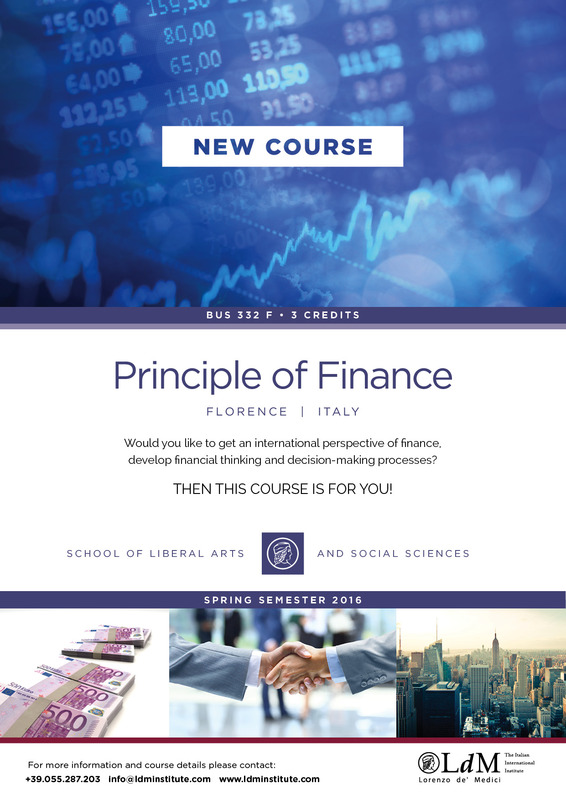 Develops financial thinking and decision-making processes, with the goal of understanding and planning for valid financial outcomes; also develops specific software application skill sets for finance. Topics and concepts analyzed include the time value of money, valuation and risk, assets, securities, financing long- and short-term, capital markets and budgeting, financial markets. Prerequisites: Business majors or minors of junior standing with 1) an introductory course in accounting and 2) Business Statistics, or equivalents. Recommended: BUS 180 Principles of Macroeconomics, or equivalent; Financial Accounting beneficial. 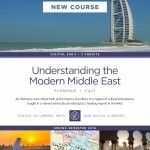 The Middle East is a fascinating but puzzling region to most people. 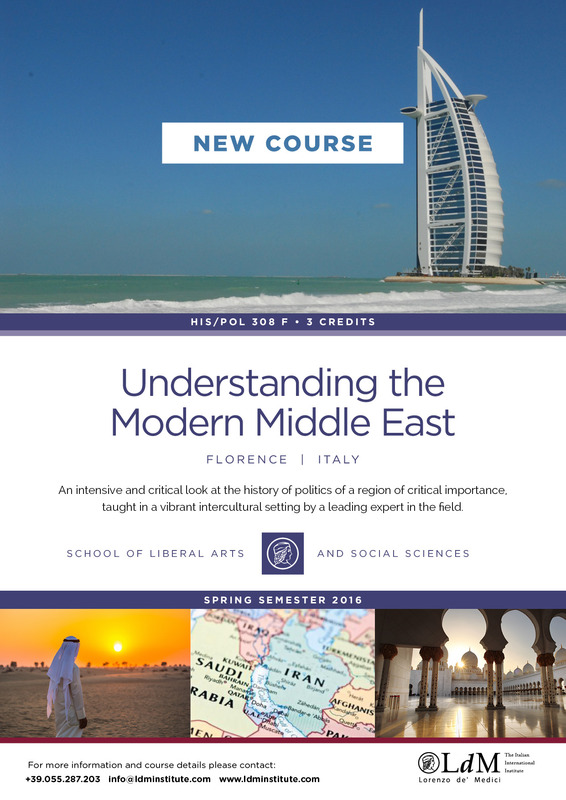 This course will examine recent events of the Modern Middle East, including the ongoing conflict between Israel and Arabs, in an attempt to increase your understanding of what is currently happening there. We will begin with a brief survey of the mandates created following the collapse of the Ottoman Empire at the end of World War One, then examine the consolidation of the states of the region during the half-century after World War Two, finally tracing the developments of the past fifteen years. We will address critical issues such as the formation of national, religious and cultural identities and the role of extremist ideologies. We will utilize documents setting out political plans and religious manifestos, enabling you to better understand the relationship between systems of beliefs, political interests, and cultural norms. We will also examine the role played by key interested “outsiders,” especially the United States. Prerequisites: POL 150 Introduction to Political Science, or equivalent.